Bogdan Strimbu heads the Management, Algorithms and Remote Sensing Lab (MARS) at Oregon State. Most of his research involves sitting at a computer and pouring over data, but recently, he’s been able to fill a niche in his field with his beloved ‘birds,’ a nickname for his collection of drones. Right now, Strimbu has a few drone-based projects, but word about the ‘birds’ has leaked around campus, and now his lab is assisting other researchers who need to see things from another perspective. They’ve worked with the Department of Ecosystems and Society, the College of Engineering, and the University Research Forests. Heffernan’s own project uses radar data from the Sentinel-1 mission in Europe to model ambient canopy moisture on a stand level. The projects will eventually help managers make better decisions about how to manage for fire threats. Ph.D. student Chu Qi’s thesis is extremely theoretical, as it is focused on applying computer vision and deep learning techniques in forest inventory and operations. 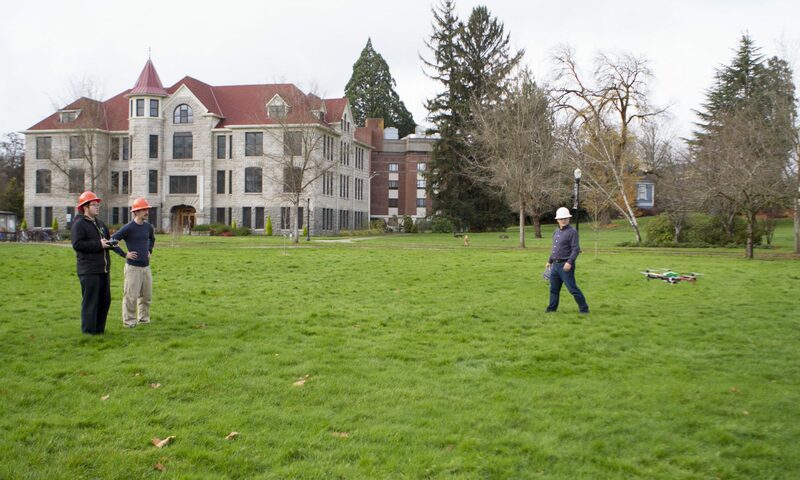 Qi holds a master’s degree in mechanical engineering from Oregon State University, but was lured to the College of Forestry by Strimbu and the promise of working with drones. He uses his mechanical experience to repair the flying machines after their inevitable accidents. Using his skills in forestry appealed to him because of the pollution problem his home city in China faces. He believes he can reduce the cost of labor when it comes to measuring ‘difficult’ forest attributes, such as taper. Qi says the accessibility of drones is what appeals to him. Strimbu’s lab will continue to do their best to keep up with demand and to feed the passion they have for flight.